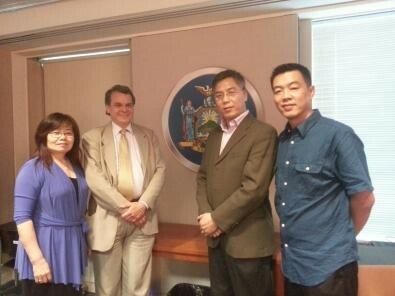 The U.S. Zhejiang Chamber of Commerce of America (ZCCA) and Empire State Development held a meeting on Jul. 3rd. Stuart M. Seldowitz, the global marketing consultant from Empire State Development, welcomed the president Zhongfang Dai of ZCCA and his visiting group. Mr. Sledowitz gave a warm welcome to ZCCA and introduced the policies and development goals they have, including how to help New York State products export, introducing the benefits for investing in New York State, and how to explore global marketing. He also pointed out that Empire State Development has seriously regarded the development in the Chinese market on international trade, investment and development, and travel aboard. President Dai suggested that ZCCA has many branches in China. ZCCA is a great platform for providing business opportunities both in China and in the U.S.